It’s our first Super Summer Deal here at Elektor and we’ve decided to start with a bang, in the form of a whopping £10 discount on our most recent book! 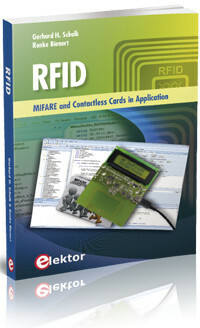 Our latest publication, RFID – MIFARE and Contactless Cards in Application, offers a comprehensive and functional introduction into the world of MIFARE, indisputably the most widely used RFID technology at current. Present in a myriad of everyday applications, Authors Renke Bienert and Gerhard Schalk systematically cover the various aspects of MIFARE, such as physical fundamentals, relevant standards, RFID antenna design, security considerations and cryptography. The complete design of a reader’s hardware and software is described in detail. The reader’s firmware and the associated PC software support programming using any .NET language. The specially developed PC program, “Smart Card Magic.NET”, is a simple development environment that supports sending commands to a card at the click of a mouse, as well as the ability to create C# scripts. Alternatively, one may follow all of the examples using Visual Studio 2010 Express Edition. This week's summer deal is an offer you can’t refuse! Order RFID – MIFARE and Contactless Cards in Application before the 2nd of July and receive a 23% discount on the regular sales price of £44.90!